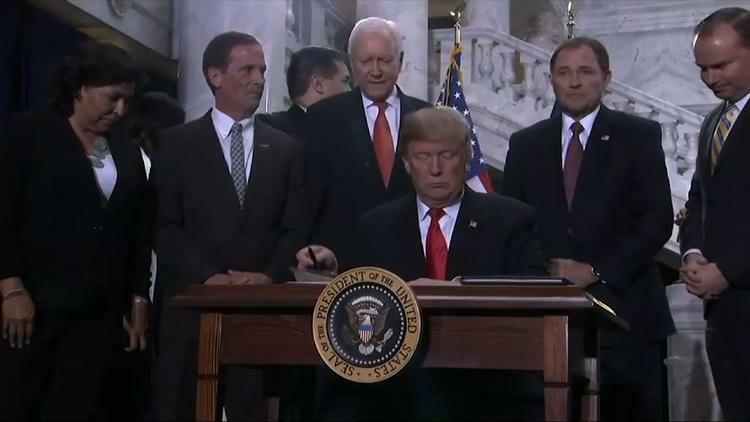 The Navajo Nation has vowed to sue U.S. President Donald Trump over his decision to shrink Utah’s Bears Ears National Monument by 85 percent. Hundreds of people – including native tribe, the Navajo, and others – along with environmentalists gathered in Washington to protest U.S. President Donald Trump’s damning decision to shrink two national monuments in Southern Utah, Bears Ears National Monument and the Grand Staircase-Escalante, significantly. The Navajo Nation vow to sue the U.S. president over his decision to significantly shrink Utah’s Bears Ears National Monument, a sprawling region of red rock canyons, by 85 percent. “The Navajo Nation has made repeated requests to meet with President Trump on this issue. The Bears Ears Monument is of critical importance, not only to the Navajo Nation but to many tribes in the region,” Navajo President Russell Begaye said in a statement on Monday. The Indigenous Navajos, who were pushing for protecting the land for several years now, consider the nearly 1.4 million acre region designated as a national monument by Obama in 2016, as sacred. ” I mean, one of the things that I want to say is, today marks one week after President Trump mentioned the Pocahontas deal, and now we’re looking at another troubling action by the White House, and it just – it’s a sad day,” Jonathan Nez, vice president of the Navajo Nation, told, Media Matters. Along with Utah’s Bears Ears National Monument, Grand Staircase-Escalante, also saw its federal protection slashed by half. The decision has been hailed as a victory by the fossil fuel industry, but the environmentalists and the native inhabitants have expressed concern saying Trump’s decision could usher nearly 100,000 sites of archaeological importance in the monuments’ desert landscapes to their ruin. “What’s next, President Trump, the Grand Canyon?” Rhea Suh, president of the Natural Resources Defense Council, asked. Wilderness Society, Great Old Broads for Wilderness and eight other groups have already filed a lawsuit defending the Grand Staircase.